"This biography is psychological in nature," Dr. Thornbury says. "I hope it forces people not just to scrutinize Larry’s life, but ideally their own." Available now, Dr. Gregory Alan Thornbury’s new book Why Should the Devil Have All the Good Music? 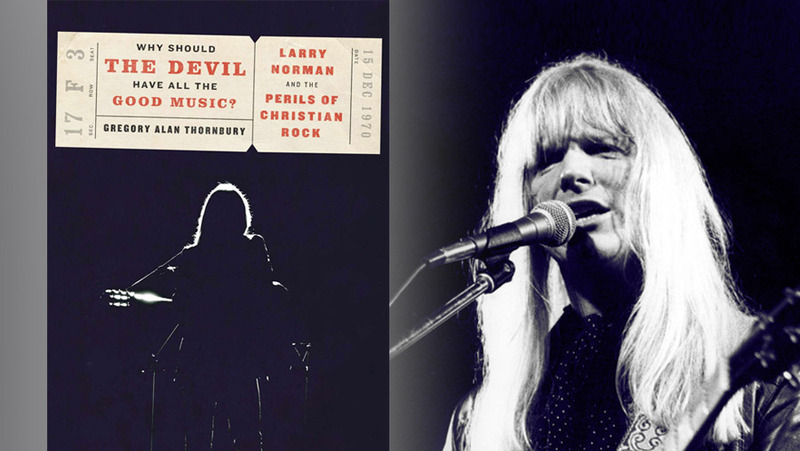 Larry Norman and the Perils of Christian Rock offers a fresh look at the life and legacy of Larry Norman, the iconic founder of “Christian rock.” The Stream caught up with Dr. Thornbury to discuss the book and how he hopes it will resonate with readers today. This interview has been edited for clarity and length. The Stream: You’ve done biographical work with a musical emphasis before, but this is your first full biography. Why Norman? Why now? Why Larry Norman and why now? Well, it’s been ten years since he passed, and his story was just so colorful. And in a way, he is a catalyzing figure at the heart of modern evangelicalism. He was sui generis — standing in between both the secular rock world and the world of Christian culture — and both sides variously being puzzled, perplexed, or downright angry with what he was doing. He called into question cultural and theological orthodoxies of both camps. The result was the soundtrack for the Jesus Movement. ([The movement was] a genuine national phenomenon, a billion dollar music sub-genre industry, and a prelude to the culture wars between faith and politics). He was being advised by Billy Graham and Francis Schaeffer, and both visited and corresponded warmly with Malcolm Muggeridge. He was both left-wing and right-wing. He didn’t just use buzzwords like “cultural engagement.” He was in the culture, in Hollywood, and being a voice to both the Church and the world about the prophetic witness of Jesus of Nazareth. In sum, I felt like all of the messy beauty of Larry’s life is needed in the world right now — especially among Christians — because there’s a lot of self-righteousness in the world and Norman’s life just forces a certain amount of introspection about what we’re really doing with our lives. This biography is psychological in nature. I hope it forces people not just to scrutinize Larry’s life, but ideally their own. The Stream: The book’s title song “Why Should the Devil Have All the Good Music?” dared to assert that rock and roll could be God’s music too. But in its day, rock and roll was more than the music. It was a lifestyle. Can music ever be wholly untangled from its cultural connotations? Thornbury: Nothing can be separated from its cultural connotations. The dictum “engage culture” is really a misunderstanding. Culture isn’t something “over there” in the next country that Christians are somehow really piously separated from. … We are all swimming in culture — politically, musically, artistically, and otherwise. As my friend David Dark says, everything is an extension of religious affections. As he beautifully inverted Senator Diane Feinstein’s put-down of Amy Barrett, “The dogma lives loudly in all of us.” So let’s stop kidding ourselves and the pretenses we keep in the Christian world — that somehow any of us aren’t constantly caught in a “Viper’s Tangle” of culture, as Francois Mauriac once put it. The Stream: You’ve called Norman the forerunner of the current generation’s attitude toward religion. Is this good or bad, or just a fact? Thornbury: Just a fact, and also both good and bad. Larry questioned and challenged church authorities — for good cause. Back when he was on the streets walking his beat on Hollywood witnessing to people about Jesus, he didn’t spot too many clerics interested in what polite Christians at the time thought were “untouchables”: kids tripping on drugs, prostitutes, dealers, and all manner of lost souls. He saw the institutional Church at the time as falling behind reaching a generation who was being swept up in the counterculture of the ’60s and ’70s. And so he was definitely “a wild boar in Christ’s Vineyard,” as Pope Leo X said of Luther. When John Lennon said the Beatles were more popular than Jesus, he meant it as a lament. Church leaders condemned Lennon, but in just a couple of years, thanks to the work of pioneers like Chuck Smith, Arthur Blessitt, and other Jesus Movement leaders, Larry could sing in Reader’s Digest, “Dear John: Who’s more popular now?” And many of those Jesus Movement young people went on to be leaders in local churches and national ministries. That’s the irony of it. So you have to take the long view on these things. How will we respond to them? If we don’t like the way Larry did it, what would we do differently? The Stream: At his zenith, Norman commanded wealth, fame, and respect from some of rock and roll’s brightest stars. But as readers will find, his own power was one of the “perils” your subtitle indicates, despite his desire to use it for good. Is it possible that it would have been better for Larry Norman’s soul had he never achieved the success he did? Thornbury: Of course power is incredibly seductive. And the abuse of it is one thing to which Christian organizations and ministries have sort of turned a willingly blind eye. Evangelicalism thrives on its leaders being mavens and Merlins. Without a truly sacramental system, when people are coming for “the Word,” rather than the Mass — things become much more dependent on the personality of the charismatic leader. But as Max Weber pointed out in Economy and Society, it will only be a matter of time before the inspirational leader gets commodified and trivialized within the bureaucratic system of the organizational culture which he has worked to create. And then there is anger from the members of the corporation that the feeling of hope and inspiration is gone. And there’s a backlash. That happened to Larry Norman. He was an artist that felt on a mission directly from God. And that can be very combustible. Because at what point does the art end, and the institution begin? And vice versa. Artists probably shouldn’t be seen as “leaders” or have too much power — because they’re supposed to be a mirror about what’s going on in the world. If you’re a leader, you have to care about both the people and the dream. It’s so demanding to hold those in tension. And when people are coming because you’re “special” — well, that works in the art world, but in the Church it’s just unacceptable. They expect radical egalitarianism, perhaps for good reason. … It was the non-Christian community and the fans that accepted Larry, and to whom Larry was the most kind. Larry was hard on his fellow believers in the Christian music industry and professional ministries, and they were in turn hard on him. But I never cease to be amazed by the accounts of tenderness and kindness that he had to hurting and ordinary people — both believers and unbelievers. He was also the guy that would give fellow Christian musicians like Eddie de Garmo all the money in his pocket when he didn’t have money for gas to get the band home. … He was the sort of person that would stand and pray outside a concert venue for hours praying with fans. He invited homeless people off the street and took them into nice restaurants until the management started feeling uncomfortable. He gave money in secret until he died to artists, and musicians, and Compassion International. I tend to be of the opinion that Larry would have done much better in his life had he not kept pursuing this dream of creating some sort of Christian artist’s colony. The high ideals and mission of someone trying to create a movement can be intoxicating and make life difficult for people whose ambitions are more pedestrian: like having a career, paying the bills, and so forth. The Stream: You have argued that “Christian” is the lamest possible adjective, especially for music or any art. Are you perhaps really saying that “Christian™” is the lamest possible adjective? Can we not retain “Christian” as a natural modifier for sacred work the Church can be proud of? The Stream: Is Larry Norman’s music worth remembering? Thornbury: Well, the Library of Congress thought so when it added Only Visiting This Planet into the National Recording Registry as a culturally, historically, and aesthetically compelling original work of American art. So the answer is an unqualified “yes.” Add to this the various artists today that look back upon Larry’s albums as a light shining through their childhoods — some of whom were more isolated in a Christian subculture that wouldn’t let you listen to secular rock music. I’ve heard from countless people about how the quality, gravitas, and songwriting excellence of Larry Norman was an absolute Godsend. All of those records up through Something New Under the Son are just splendid in their own ways. In the end, though, what I hear most about are Larry’s performances live. There was something mystical and unique about them. Larry mesmerized people and quieted people’s souls in concert. … It was an astonishing gift. I can’t think of too many performers who have that ability. I think artists today should study Larry in that respect. That’s most definitely worth remembering. The Stream: Evangelicals often pin their hopes on charismatic artists, pastors, and politicians, only to be crushed by their fall. How do we discourage obsessive hero-worship and cultivate independent, tough-minded Christianity? Andy Crouch wrote powerfully on this front last week. Both high church and low church structures seem to struggle with sin and corruption in their hierarchies. I think we’re going to have to go through a less triumphalist phase, with less tub thumping and chest puffing from leaders. I think that leaders should stay for a few years and cycle out of leadership for a while and be forced to go through quiet phases of their lives. And then there’s the money. It takes so much money to keep our institutions running, and it’s really hard to know when the love of money is the thing which is really driving you in your ministry or nonprofit. Perhaps vows of poverty might help for people running institutions? The Stream: We should address what might be Larry’s most disturbing fall: an Australian woman and her son who claim Norman was the father, and he abandoned them. (Anyone can read here and here, watch here and here, and judge for himself.) In your book, you leave this to the very end and say its truth would require “a different lens” to interpret Norman’s story, so contrary does it seem to his righteous image. I’ll just ask this: If it’s true, how much does it matter? Here is what I know about self-righteousness from the Larry Norman story: it will come back to haunt you, and it might even kill you. That’s what matters. And I think that matters a lot. Do I think it utterly vitiates Larry’s earlier work as an artist and as a voice in the Jesus Movement? Not any more than other Christian heroes or forerunners whose legacies are a mixed bag of triumphs and troubled outcomes. There’s so much in the Bible about judging other people’s sins and ignoring your own. So I would say, “Learn a lesson from Larry Norman.” Larry could really subject people to exacting standards of both holiness and righteousness. People expected the same from him, and he failed to live up to his own standards. Larry was an artist who accepted the mantle of a prophet. He could not hold the two worlds together forever, it seems to me. What’s amazing to me is the desire for the scapegoat for the things that go wrong in our lives. Everyone wants to either be a saint or a victim. And I think the rest of the world looks at the Church and doesn’t much care for the way we handle our own internal matters of repentance, kindness, and forgiveness. So they really do wonder why they should really trust us. I wrote this book to open up a conversation about these matters in the Christian community. I hope that these issues, and not the only specific details of Larry’s own biography, are what people come away thinking and talking about after they’ve read this book. The Stream: You echo Larry’s own song lyrics intriguingly when you end the book by saying that Larry “believed Jesus loved him … but he also loved himself.” Is the latter really “the hardest thing for us to do,” as you suggest? Thornbury: I think it’s incredibly hard to love yourself the way you actually are, and not some version that you or someone else has created for you in the place of the person who really lives and breathes in the world. So yes, I think that’s really the hardest thing for people to do. I understand that there was a legitimate backlash against the therapeutic culture in Christian theology, especially back during the 1990s. But sweeping away mental health concerns and replacing them with theological propositions was an over-correction. Putting it biblically, I think it’s very hard to love the “Romans 7 wretched man,” with the result that we wind up having pity on ourselves and others. Despite the suffering Larry endured in his life, the emotional and physical pain, despite his own shortcomings, sins, and failures, this one thing I know: He died feeling known by God — that he was somehow the object of God’s special care, and that his life meant something to others. Would it have been better if he was more honest about his sins? Yes. But on the other hand, he did treat so many people whom the church de facto treated as outcasts with incredible compassion. I think it’s because he really believed that he was the object of God’s love, and everybody should feel that way too. I recall that episode . Hank was a something of a voice of the people howbeit w/unconscious yet deliberate liberal leanings from his “creators’ . That being the case , he clearly did not have the “big picture” where things of faith & it’s subsequent effect on aspects of the culture it impacted are concerned. Nevertheless I was both surprised & disheartened when the series was abruptly cancelled. I guess Hank had run out of propane …. Music is perhaps the most potentially powerful form of communication given among men by the Divine. Even w/out words music can sway a soul in any number of directions, There are those who suggest that melodic or discordant tunes are literally a part of our DNA. How much more viable is this grand creation when paired w/both the sentiment & revelation of the living God ? Therein lies it’s greatest challenge. Both for the artist as well as the hearer. The challenge to remain faithful to the heart of the matter. You know something akin to both integrity & authenticity in what is being promoted. Promoting support of Gods perceived objectives &/or as representing oneself in effect as a messenger of Gods revealed truth. Sadly in my perspective that isn’t always the case. Yet better to offer up a good effort as such than to relegate the gospel to a musical wasteland. One in which culture has left behind. With cause. Here is where guys like Mr Norman excel. Both the church & the secular culture are better off in the wake of this progenitor of a virtual industry phenomena. Both because of & at times perhaps in spite of this unusual man ….